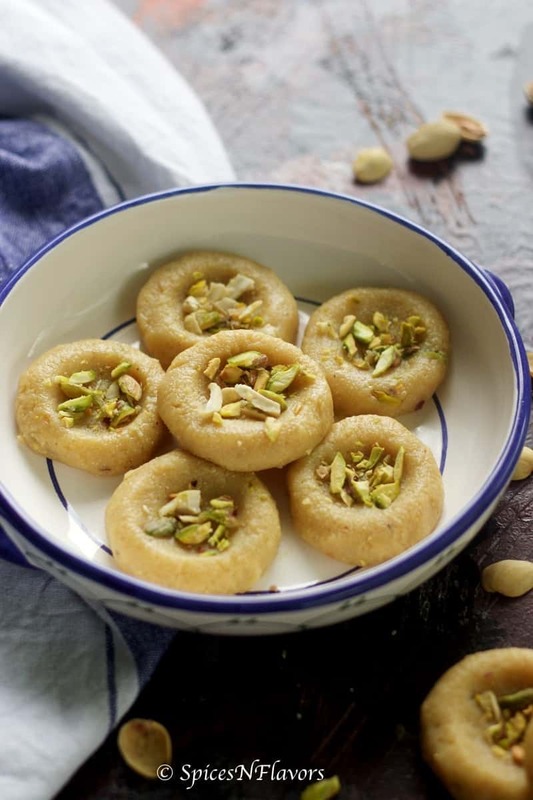 Butterscotch Peda is an ingenious way of giving a little twist to our regular flavour pedas with one of our most favourite one – Butterscotch. Sounds interesting?? 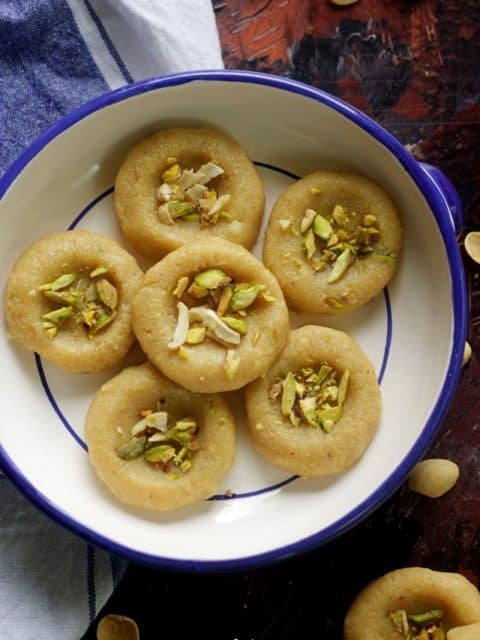 Butterscotch Peda is a delicious, smooth and flavourful peda with a lot of texture play. The butterscotch sauce gives it a more of a toffee kind of taste. From my posts this week you would have got to know that I love Diwali. Its one of my favourite festivals of all time. By the way which ones is yours?? So to celebrate this festival; all my preparations have begun in full swing..
And the best thing of all is to try this refreshing Paan Shots.. Wait a minute.. It doesn’t end here.. I still have few more recipes planned. And my mom will also be making few goodies. This year its gonna be super special. Whats your plan for Diwali? 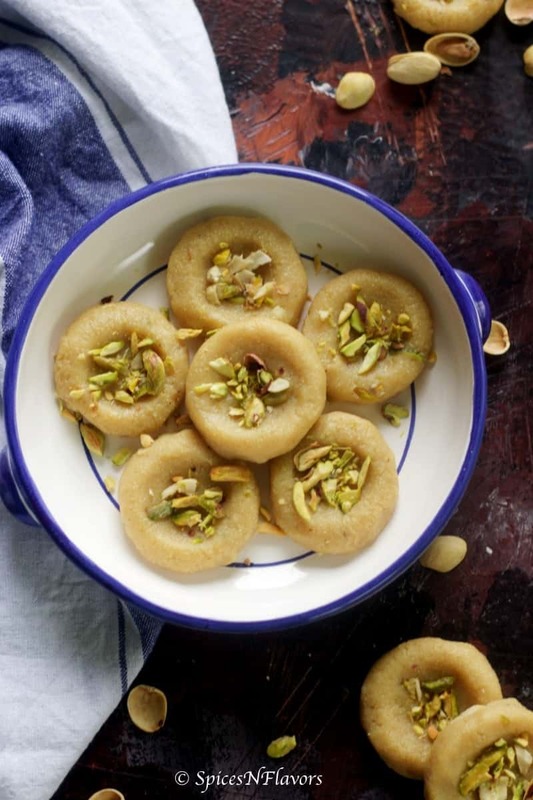 Coming to today’s simple Butterscotch Peda recipe..
Firstly let me tell you all its super simple to make. The addition of roasted rava is the secret. I mean rava absorbs the moisture and thickens it quickly and hence this peda comes together in just 10 mins. cool na.. The other important flavouring agent that I have to talk about is this Homemade Butterscotch Sauce. (Update: The recipe for this super easy Butterscotch Sauce is now up on the blog. Click here to know) You all know by now that I prefer easy and quick method of cooking; the impatient me!! so this sauce also comes together in 5 mins. Hope you try these interesting recipes for this Diwali and make me a part of your celebration. If you like this recipe then do let me know by tagging me, tweeting me or even instagram me. I would love to follow you and your posts. 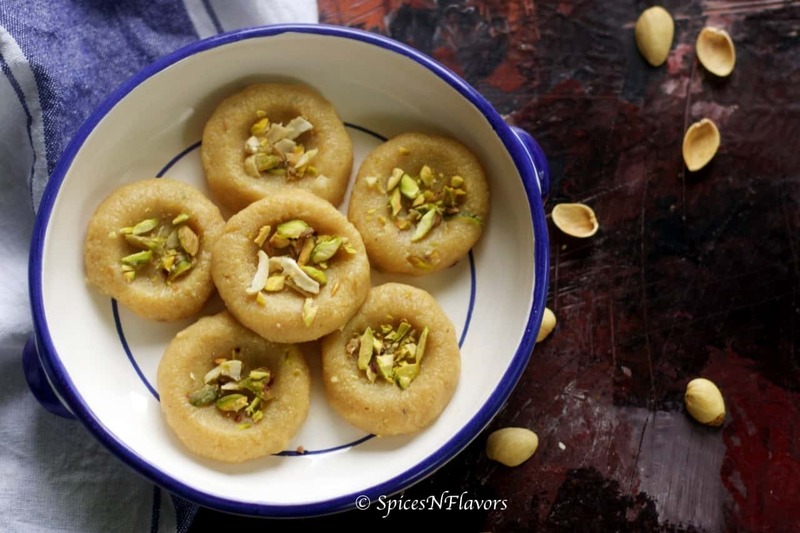 Butterscotch peda is an unique and different toffee flavoured twist to the regular pedas that we usually make. In a pan over low heat, melt some ghee. Once melted switch off the gas and add Warm milk. Mix them and add roasted rava, milk powder and cashew powder. Mix and switch on the gas (low to med flame). Add sugar and mix till it starts thickening. Transfer it to a greased plate and let it cool for 30 mins. Make some indentation with your index finger and add some chopped pistachios on top. Allow it to air dry for another 30 mins to 1 hour and enjoy it this diwali. Click here for Butterscotch Sauce recipe. 1. 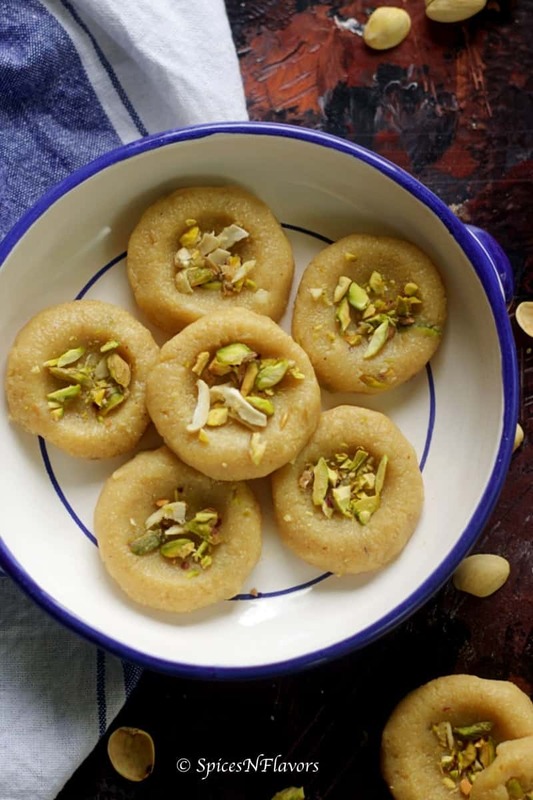 If you use warm milk then making this Butterscotch Peda would be quicker as the rava will absorb all the moisture faster. You can however use room temperature milk too if you wish. 2. For making cashew powder just grind some cashew nuts coarsely. 3. You can use readymade roasted rava or dry roast rava till it turns pink and use. 4. If you do not have homemade butterscotch sauce then you can use store-bought too. Or do let me know if you would like to know the recipe of this 5 mins sauce recipe I would try to post before Diwali. 5. Since the butterscotch sauce is also sweet I added about 3 tbsp of sugar only which was sufficient and perfect however you can adjust it as per your needs. I cannot stress on how delicious these Butterscotch Peda turned out to be. Trust me and try it out once; I am sure you all will absolutely love it.. Please post the recipe for homemade butterscotch sauce. Can’t wait to try out this recipe for Diwali.